The Papua New Guinea Joint Security Task Force Commander for APEC 2018 Gari Baki said the security preparations for the APEC Summit in 2018 is on track. 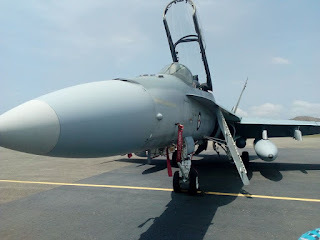 He said the landing of the two F18 Super hornets by the Royal Australian Air Force (RAAF) was to tell the whole world that PNG is ready to host APEC in 2018. He clarified that Australian Defence Force has been requested by the Joint Task Force team to take over the air security as PNG lacks capability in that area. He said not only that, the Australian Defence Force will also be assisting our security in areas where we are not capable of handling. Baki said going forward, the media will be allowed to attend all the meeting by the Joint Task Force and disseminate information to the greater populace about the preparation leading up to the Summit in 2018. The two F18 hornets arrived in Port Moresby last Thursday and flew three times over Ela Beach before heading back to Townsville, Australia.